WHAT! Just stop the presses! This is Hampton Roads! What in the heck is the West Coast doing on here?! Well, dear reader, we are comprised of so many different hometowns thanks to the military (and some know that I was born across the street from the San Diego Zoo (aka where the animal obsession began), so there's that tidbit). Inspiration surrounds us from all over the world, and we share so many similar attributes, yet are distinctively different. You'll see a lot of cultural and geographical inspiration here at Tidewater and Tulle as we grow because there is too much beauty in the world to not share it locally and be inspired to incorporate it into our daily lives. While this blog was being built, I made some wonderful blogger friends along the way via the wonders of social media. One of those friends is Ariana of Hey Wedding Lady! And this Christmas, we decided to do a little East Meets West collaboration through inspiration boards and local traditions... I share Hampton Roads with Cali, and she shares Cali with Hampton Roads. So without further ado, I'll let Ariana take it from here! A CALIFORNIA CHRISTMASCalifornia does Christmas a little differently than any other place I've been. A few hours drive in any direction and you can find the sea and sun, or the snow and mountains. I've lived most of my life on the Central Coast - we have the perfect combination of sprawling beaches, rugged cliffs, and immense redwood forests. It's not unusual to celebrate the holidays with sunny, sixty-degree weather, and yes, I have spent a Christmas or two at the beach! We may not get a white Christmas in the Central Coast, but we still like to pull out all the stops! It's not uncommon to see Santa Claus in surfer gear, or a palm tree sporting Christmas lights. The best way to get a feel for the season is to pay a visit to the beachside towns scattered up and down the Central Coast - the Main Streets of Santa Cruz, Capitola, Monterey, and Carmel by the Sea are the epitome of coastal holiday cheer! Since we don't get snow on the coast, the most vivid feature of the winter in California is the light. Once the days start to grow shorter, the afternoons and evenings are infused with rich, golden light that lingers for hours. The hills that roll along the Pacific Coast Highway turn tawny before the winter rains set in, and even the ocean casts back a golden glitter from the low sun. I wanted to capture that gold hue, along with some of the vibrant color that California is known for, in this board. CALIFORNIA HOLIDAY TRADITIONSChelsea is spotlighting some holiday traditions from Hampton Roads to put you in the perfect Christmas spirit! California has winter activities that range from the traditional O Tannenbaum sort to the unique West Coast quirkiness that we're known for! When I was little, we'd dress for the theater and go to San Francisco for the Christmas Revels, then visit the grand hotels to see their holiday decorations, and cap it off with hot chocolate in Union Square. It was the closest to Miracle on 34th Street as it gets in California, but the Revels celebrate traditions dating much further back with songs, plays, and dances from a different time period and culture every year! The fair's website puts it best - a Victorian Christmas card come to life! The Cow Palace turns into a sprawling recreation of London during Dickens' time, with vintage shops and handmade gifts, hot toddies, authentic English food, shows, and more! It's a fabulously immersive way to celebrate a vintage Christmas. This one is a yearly 'must' for Santa Cruz area families! Bundle up and visit the Yacht Harbor for a twilight parade of festive holiday boats. Each boat tries to outdo the last, so the designs get more and more elaborate as the parade continues, making it worth staying out in the cold! Harbor restaurants get into the spirit with food and warm drinks and the view from the Crow's Nest can't be beat! There are dozens of Christmas tree farms scattered up and down the coast, with many more in the Santa Cruz Mountains, but nothing says California Christmas like chopping down a beautiful Douglas Fir with a full view of the Pacific Ocean! This one is a personal favorite of mine - my dad and I would visit the village to shop for all of the women in our family, picking out jewelry, decorations, and local items from the boutiques set along the Capitola Esplanade. At night, the palm trees lining the streets glow with white lights, making it the perfect Central Coast holiday destination. Curious to see our Hampton Roads Christmas inspiration over on the West Coast? 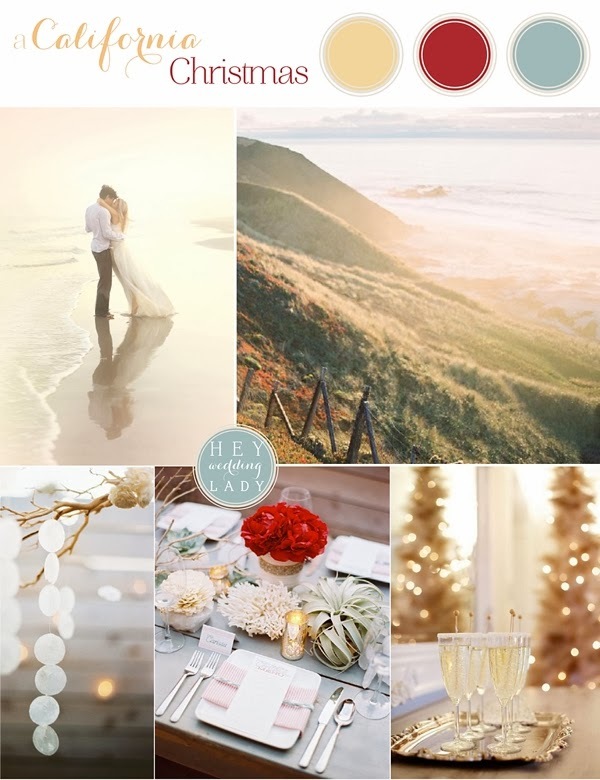 You can get to know this California wedding blogger more on Facebook, through her pins on Pinterest, and captures on Instagram!